Dokra craft is one of the earliest known methods of non-ferrous metal casting. Dokra statues are revered all over the world for its primeval simplicity and enthralling folk motifs. 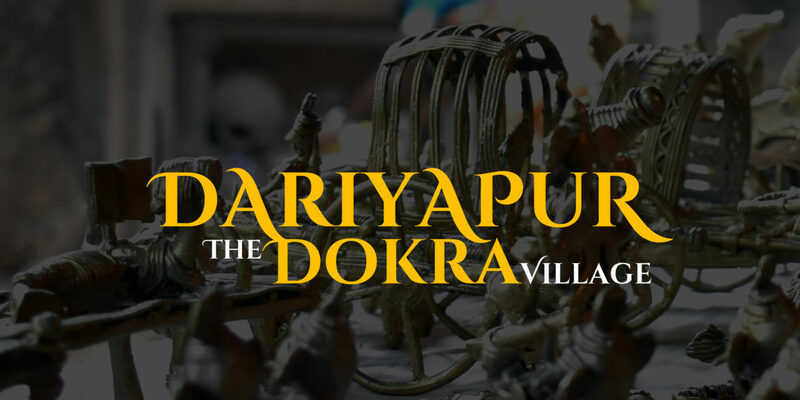 Initially, the Dokra craftsmen of Bankura settled in the Rampur suburb on the fringes of the district. During the latter half of 1960s the Dokra makers were provided with a settlement in Bikna by the Government. The place was named as Shilpa Danga. Around 58 families and 163 Dokra crafts person reside in Shilpa Danga in which 49% of the crafts person are women. The place Bikna is very well connected on the main road around 3 kms from Bankura. Located very close to Bankura the place find buyers coming to the place and procuring Dokra items. Some of the renowned craftsmen of the area like Gita Karmakar and Sudhir Karmakar. However, the majority of the artists are still poor and living in adverse conditions. The environmental condition of the place is very poor. The entire area is having a boundary and it seems that the craftsmen are stacked inside the boundary. The houses are mostly having asbestos sheet and some are having RCC roof. The roof of all the houses are in a dilapidated condition and water oozes inside the room during rainy season. The furnaces are attached close to the building and leads to various adverse health effects. The artisans works in a poor living condition without sufficient protective gears and safety measures. Rural Craft Hub development at Bikna is a project undertaken by the Department of MSME&T with a holistic approach in developing the life of the traditional craftsmen keeping a focus to enhance livelihood of the artisans. UNESCO and its partner Contact Base is implementing the project at the grassroot. Baseline study, identification of the beneficiaries, soft skill interventions and linkage of the artists to the market, creating a sustainable livelihood model at the hubs, financial inclusion, and convergence with different schemes are major interventions to be taken up as part of the project. Hardware interventions as required will be linked with various schemes of West Bengal Khadi & Village Industries Board. This proposal details out the hardware interventions required at Bikna to develop it into a craft hub and generate economic and social benefits out of the initiative. Detailed study, field visits, EDP workshops, product diversification workshops have revealed that presently the craftsperson have a society which is defunct and which needs to be strengthened to make the craft effective. The issues that the craftsperson faces are that of lack of innovative designs and market worthy products, lack of utility products, marketing, procurement and processing of raw materials at effective rate, managing the entire sales and marketing effectively, dependence on money lenders, providing quality orders in time, finishing of the product and very low variation in terms of diversification of products. Improving the living conditions of the artisans is thus of paramount importance. A land of more than 3500 sq ft is available with the artisan society and BLRO has also given clearance of the land. The land is outside of the residing area and thus workshed, furnace, shops, lounge area, toilet block can be developed in the land. Improving conditions inside the residing area is also important and after consultations with the artisans it is suggested that a building just beside the gate (unused) can be demolished to construct a proper toilet block. Another toilet block can also be constructed in place of the existing one at the backside of the residing area. Three worksheds present in the area needs renovation along with roof of all the building. The workshed also required some machines like buffing machine, hand drill, pressure machine for making wax threads, furnace blower machine, porcelain cubicles, digital weighing machine, angle grinder, tongs, ladles, protective gears, computer and peripherals and fire extinguisher. Proper drinking water facility, sewerage and electricity connection is required in the area. Project for Rural Craft Hub on Dokra at Dariyapur with Total Project Cost of Rs. 70.90 lakhs involving 133 nos. of Artisans. Facilities Provided: Skill development training and exposure visit completed. Common Facility Centre established with machines, training hall, museum etc.Has been extended to Rural Craft &amp; Cultural Hub.